Alternators are not always connected directly to the airplane engine like dc generators. Since the various electrical devices operating on ac supplied by alternators are designed to operate at a certain voltage and at a specified frequency, the speed of the alternators must be constant; however, the speed of an airplane engine varies. Therefore, some alternators are driven by the engine through a constant speed drive installed between the engine and the alternator. A typical hydraulic-type drive is shown in figure 9-46. The following discussion of a constant speed drive system will be based on such a drive, found on large multiengine aircraft. The constant speed drive is a hydraulic transmission which may be controlled either electrically or mechanically. provided the input remains between 2,800 and 9,000 rpm. If the input, which is determined by engine speed, is below 6,000 rpm, the drive increases the speed in order to furnish the desired output. This stepping up of speed is known as overdrive. In overdrive, an automobile engine will operate at about the same rpm at 60 mph as it does in conventional drive at 49 mph. In aircraft, this principle is applied in the same manner. The constant speed drive enables the alternator to produce the same frequency at slightly above engine idle rpm as it would at takeoff or cruising rpm. With the input speed to the drive set at 6,000 rpm, the output speed will be the same. This is known as straight drive and might be compared to an automobile in high gear. However, when the input speed is greater than 6,000 rpm, it must be reduced to provide an output of 6,000 rpm. This is called underdrive, which is comparable to an automobile in low gear. Thus, the large input, caused by high engine rpm, is reduced to give the desired alternator speed. As a result of this control by the constant speed drive, the frequency output of the generator varies from 420 cps at no load to 400 cps under full load. This, in brief, is the function of the constant speed drive assembly. Before discussing the various units and circuits, the overall operation of the transmission should be discussed. The transmission is mounted between the generator and the aircraft engine. Its name denotes that hydraulic oil is used, although some transmissions may use engine oil. 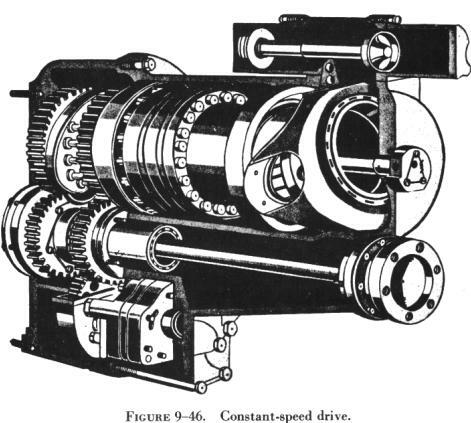 Refer to the cutaway view of such a transmission in figure 9-47. The input shaft D is driven from the drive shaft on the accessory section of the engine. The output drive F, on the opposite end of the transmission, engages the drive shaft of the generator. The input shaft is geared to the rotating cylinder block gear, which it drives, as well as to the makeup and scavenger gear pumps E.
The makeup (charge) pump delivers oil (300 psi) to the pump and motor cylinder block, to the governor system, and to the pressurized case, whereas the scavenger pump returns the oil to the external reservoir. The rotating cylinder assembly B consists of the pump and motor cylinder blocks, which are bolted to opposite sides of a port plate. The two other major parts are the motor wobbler A and the pump wobbler C. The governor system is the unit at the top of the left side in the illustration. The cylinder assembly has two primary units. The block assembly of one of the units, the pump, contains 14 cylinders, each of which has a piston and pushrod. Charge pressure from the makeup pump is applied to each piston in order to force it outward against the pushrod. It, in turn, is pushed against the pump wobble plate. If the plate remained as shown in part A of figure 9-48, each of the 14 cylinders would have equal pressure, and all pistons would be in the same relative position in their respective cylinders. But with the plate tilted, the top portion moves outward and the lower portion inward, as shown in part B of the illustration. As a result, more oil enters the interior of the upper cylinder, but oil will be forced from the cylinder of the bottom piston. If the pump block were rotated while the plate remained stationary, the top piston would be forced inward because of the angle of the plate. This action would cause the oil confined within the cylinder to be subjected to increased pressure great enough to force it into the motor cylinder block assembly. Before explaining what the high pressure oil in the motor unit will do, it is necessary to know something about this part of the rotating cylinder block assembly. The motor block assembly has 16 cylinders, each with its piston and pushrod. These are constantly receiving charge pressure of 300 psi. The position of the piston depends upon the point at which each pushrod touches the motor wobble plate. These rods cause the wobble plate to rotate by the pressure they exert against its sloping surface. This is how the action works: the piston and pushrod of the motor are pushed outward as oil is forced through the motor valve plate from the pump cylinder. The pushrods are forced against the motor wobble plate, which is free to rotate but cannot change the angle at which it is set. Since the pushrods cannot move sideways, the pressure exerted against the motor wobble plate's sloping face causes it to rotate. In the actual transmission, there is an adjustable wobble plate. The tilt of the pump wobble plate is determined by the control cylinder assembly. For example, it is set at an angle which causes the motor cylinders to turn the motor wobble plate faster than the motor assembly, if the transmission is in overdrive. The result described is produced by the greater pressure in the pump and motor cylinders. With the transmission in underdrive, the angle is arranged so there is a reduction in pumping action. The subsequent slippage between the pushrods and motor wobble plate reduces the output speed of the transmission. When the pump wobble plate is not at an angle, the pumping action will be at a minimum and the transmission will have what is known as hydraulic lock. For this condition, the input and output speed will be about the same, and the transmission is considered to be in straight drive. To prevent the oil temperature from becoming excessively high within the cylinder block, the makeup pressure pump forces oil through the center of this block and the pressure relief valve. From this valve, the oil flows into the bottom of the transmission case. A scavenger pump removes the oil from the transmission case and circulates it through the oil cooler and filter before returning it to the reservoir. At the start of the cycle, oil is drawn from the reservoir, passed through a filter, and forced into the cylinder block by the makeup pressure pump. The clutch, located in the output gear and clutch assembly, is an overrunning one way, sprag-type device. Its purpose is to ratchet if the alternator becomes motorized; otherwise, the alternator might turn the engine. Furthermore, the clutch provides a positive connection when the transmission is driving the alternator. There is another unit of the drive which must be covered, the governor system. The governor system, which consists of a hydraulic cylinder with a piston, is electrically controlled. Its duty is to regulate oil pressure flowing to the control cylinder assembly, as shown in figure 9-49. The center of the system's hydraulic cylinder is slotted so the arm of the pump wobble plate can be connected to the piston. As oil pressure moves the piston, the pump wobble plate is placed in either overspeed, underspeed, or straight drive. Since it is driven by a drive gear in the transmission, the tachometer (often called tach) generator, a three phase unit, has a voltage proportional to the speed of the output drive. Its voltage is changed from ac to dc by the rectifier. After rectification, the current flows through the resistor, rheostat, and valve and solenoid. Under normal operating conditions, the output of the tach generator causes just enough current to enter the valve and solenoid coil to set up a magnetic field of sufficient strength to balance the spring force in the valve. When the alternator speed increases as the result of a decrease in load, the tach generator output increases also. Because of the greater output, the coil in the solenoid is sufficiently strengthened to overcome the spring force. Thus, the valve moves and, as a result, oil pressure enters the reduced speed side of the control cylinder. In turn, the pressure moves the piston, causing the angle of the pump wobble plate to be reduced. The oil on the other side of the piston is forced back through the valve into the system return. Since the angle of the pump wobble plate is smaller, there is less pumping action in the transmission. The result is decreased output speed. To complete the cycle, the procedure is reversed. With the output speed reduction, tach generator output decreases; consequently, the flow of current to the solenoid diminishes. Therefore, the magnetic field of the solenoid becomes so weak that the spring is able to overcome it and reposition the valve. If a heavy load is put on the ac generator, its speed decreases. The generator is not driven directly by the engine; the hydraulic drive will allow slippage. This decrease will cause the output of the tach generator to taper off and, as a result, weaken the magnetic field of the solenoid coil. The spring in the solenoid will move the valve and allow oil pressure to enter the increase side of the control cylinder and the output speed of the transmission will be raised. There are still two important circuits which must be discussed: the overspeed circuit and the load division circuit. The generator is prevented from overspeeding by a centrifugal switch (S in figure 9-52) and the overspeed solenoid coil R, which is located in the solenoid and valve assembly. The centrifugal switch is on the transmission and is driven through the same gear arrangement as the tach generator. The aircraft dc system furnishes the power to operate the overspeed coil in the solenoid and coil assembly. If the output speed of the transmission reaches a speed of 7,000 to 7,500 rpm, the centrifugal switch closes the dc circuit and energizes the overspeed solenoid. This component then moves the valve and engages the latch which holds the valve in the underdrive position. To release the latch, energize the underdrive release solenoid. The load division circuit's function is to equalize the loads placed on each of the alternators, which is necessary to assure that each alternator assumes its share; otherwise, one alternator might be overloaded while another would be carrying only a small load. In figure 9-53, one phase of the alternator provides power for the primary in transformer G, whose secondary supplies power to the primaries of two other transformers, J1 and J2. Rectifiers K then change the output of the transformer secondaries from ac to dc. The function of the two capacitors, L, is to smooth out the dc pulsations. The output of the current transformer F depends upon the amount of current flowing in the line of one phase. In this way, it measures the real load of the generator. The output voltage of the current transformer is applied across resistor H. This voltage will be added vectorially to the voltage applied to the upper winding of transformer J by the output of transformer F. At the same time as it adds vectorially to the upper winding of transformer J, it subtracts vectorially from the voltage applied to the lower winding of J. This voltage addition and subtraction depends on the real load of the generator. The amount of real load determines the phase angle and the amount of voltage impressed across resistor H. The greater the real load, the greater the voltage across H, and hence, the greater the difference between the voltages applied to the two primaries of transformer J. The unequal voltages applied to resistor M by the secondaries of transformer J cause a current flow through the control coil P.
The control coil is wound so that its voltage supplements the voltage for the control coil in the valve and solenoid assembly. The resulting increased voltage moves the valve and slows down the generator's speed. Why should the speed be decreased if the load has been increased? Actually, systems using only one generator would not have decreased speed, but for those having two or more generators, a decrease is necessary to equalize the loads. The load division circuit is employed only when two or more generators supply power. In such systems, the control coils are connected in parallel. If the source voltage for one of these becomes higher than the others, it determines the direction of current flow throughout the entire load division circuit. As explained before, the real load on the generator determines the amount of voltage on the control coil; therefore, the generator with the highest real load has the highest voltage. As shown in figure 9-54, current through No. 1 control coil, where the largest load exists, aids the control coil of the valve and solenoid, thereby slowing down the generator. (The source voltage of the control coils is represented by battery symbols in the illustration.) The current in the remaining control coils opposes the control coil of the valve and solenoid, in order to increase the speed of the other generators so the load will be more evenly distributed. On some drives, instead of an electrically controlled governor, a flyweight-type governor is employed, which consists of a recess-type revolving valve driven by the output shaft of the drive, flyweights, two coil springs, and a nonrotating valve stem. Centrifugal force, acting on the governor flyweights, causes them to move outward, lifting the valve stem against the opposition of a coil spring. The valve stem position controls the directing of oil to the two oil out lines. If the output speed tends to exceed 6,000 rpm, the flyweights will lift the valve stem to direct more oil to the side of the control piston, causing the piston to move in a direction to reduce the pump wobble plate angle. If the speed drops below 6,000 rpm, oil is directed to the control piston so that it moves to increase the wobble plate angle. Overspeed protection is installed in the governor. The drive starts in the underdrive position. The governor coil springs are fully extended and the valve stem is held at the limit of its downward travel. In this condition, pressure is directed to the side of the control piston giving minimum wobble plate angle. The maximum angle side of the control piston is open to the hollow stem. As the input speed increases, the flyweights start to move outward to overcome the spring bias. This action lifts the valve stem and starts directing oil to the maximum side of the control piston, while the minimum side is opened to the hollow stem. At about 6,000 rpm, the stem is positioned to stop drainage of either side, and the two pressures seek a balance point as the flyweight force is balanced against the spring bias. Thus, a mechanical failure in the governor will cause an underdrive condition. The flyweight's force is always tending to move the valve stem to the decrease speed position so that, if the coil spring breaks and the stem moves to the extreme position in that direction, output speed is reduced. If the input to the governor fails, the spring will force the stem all the way to the start position to obtain minimum output speed. The output speed of the constant speed drive is regulated by an adjustment screw on the end of the governor. This adjustment increases or decreases the compression of a coil spring, opposing the action of the flyweights. The adjustment screws turn in an indented collar, which provides a means of making speed adjustments in known increments. Each "click" provides a small change in generator frequency.